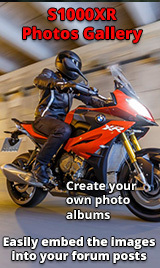 Hello , i have just jumped across from the S1000r forum after making the decision to opt for xr. I went into my local dealer ( motorad central ) yesterday to make an enquiry about my s1000r 2014 service and decided to take the new model out . My dealer thought i should try the Xr out which i was not to keen on however decided i would try it after the s1000r . After returning the s1000r ( which was very nice ) i reluctantly trundled out on the Xr down the A7 . Within 10 minutes my eyes were on stalks as i made rapid progress , cornering just as quick as any other bike i had ridden . I am astounded how good this bike handles and its the first time i have travelled in comfort . 2 hours later back to the dealer to trade my beloved s1000r in for a new xr sport se which i collect next week . I cant believe i have waited this long for this type of bike .Thank you in advance for any questions i shall surely ask in the future . Pictures will follow . Hi and welcome to the XR side , I've had mine now for coming up to a year and despite loving it find myself spending small fortunes on it tweaking it up! Great part of the country up there for your new toy , enjoy it!